I WAS SORTING OUT MY RAGGED, PECULIAR COMIC book collection the other day, when I realized that one of my favorite genres might well be completely unknown to comic fans who came of age after the 1970s. It was in the middle of that decade that romance comics limped from the stage; once the proud holder of a full quarter of the marketplace, these forgotten illustrated soap operas fell victim to the vagaries of the comic book industry and shifting social mores. A couple of quick inquiries confirmed my suspicions. "Romance comics? What's that? Like Archie and Veronica?" asked one 20-something alternate fan boy. "Kind of," I said. "Only not funny." A typical romance story was told in the first person, allegedly from a true account confided to a trusted comic book professional. They generally followed a predictable dramatic arc, with a fairly wide range of crises  unrequited love, class barriers, jealousy, career conflicts, haunted pasts, etc.  inevitably resolved with a monogamous happily-ever-after ending. "Well, darling, suddenly I don't love you anymore! I can't explain it  but I just don't!" announces Tony at the outset of Changes of Heart, the lead story from the April 1965 issue of Young Romance (the longest-running title in the romance pantheon). He and Brenda had been so right for each other. Then  boom! The thrill is gone! Brenda doesn't know how she'll carry on. She dates, but can't get Tony out of her head. One night the doorbell rings  "It's Tony!" she thinks. But it isn't Tony, it's Tony's old friend Bill Oliver. Tony's blown town with no forwarding address, and Bill thought she might know where to find him. Brenda breaks down sobbing, spilling the whole story. Bill listens sympathetically, then admits that he, too, was recently dumped. They start hanging out, and suddenly realize they've fallen for each other. "There was no need for words  our love was strong because it had been born out of pain." I didn't always like romance comics. As a kid I had naturally spurned them as "girls' comics," preferring the deadpan surrealism of Superman's Pal Jimmy Olsen and Bob Kane's Batman. If there was absolutely nothing else available and nobody watching, I might plow through one, but I wouldn't enjoy it. A few years later, when I started making collages out of comics, romance titles became a major source of strange dialogue fragments  despised by superhero geeks, their uncollectibility made them cheap and plentiful, clogging the discard bins at comic book stores. But as I scanned the stories for improbable captions or oddly drawn panels, I found myself actually growing attached to them, and not wanting to cut them up. At first I found their formulaic quality strangely hypnotic, like a Samuel Beckett novel, their anachronistic moral positions unintentionally hilarious. But as I began to delve deeper, I realized that many of the great talents of comics had worked the romance genre. The first one I noticed was Gene Colan, an underrated silver-age penciler who handled Daredevil and Dr. Strange for years, and popped up in DC's latter-day love titles. As I learned more, other stellar names surfaced: Wally Wood, Frank Frazetta, John Romita, Alex Toth. But nothing was quite so startling as the revelation that the entire genre had been invented by my favorite mainstream comic artist, Jack Kirby, creator of Captain America, Thor, the Fantastic Four, X-Men and many other classic heroes, as well as the mythic, ambitious science-fiction epic Fourth World series of the early '70s. In 1947, Kirby and his partner, Joe Simon, were already one of the most highly regarded production teams in the comics industry, when Simon had an idea. As he remembered in his 1990 memoirs, The Comic Book Makers, "It had long been a source of wonder to me that so many adults were reading comic books designed for children, and now I was finding myself increasingly wondering why there was a dearth of comic book material for the female population." Young Romance #1 hit the stands in September, co-produced by the artists with a small Manhattan publisher, in a milestone of artists' business autonomy. It was an enormous success. Copying their own formula, they added Young Love, and combined sales exceeded 2 million copies per month. Scores of imitators sprang up immediately, and within a year there were 125 separate romance titles in play. 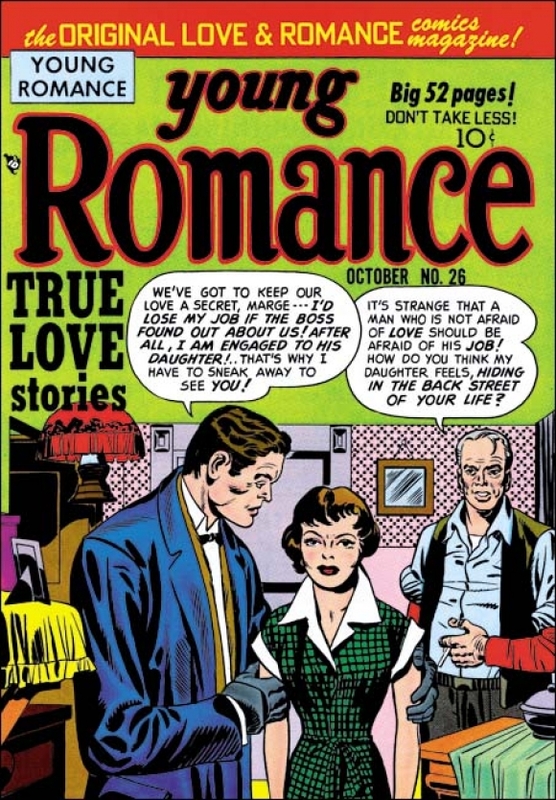 In 1952, over 500 original romance comic books were published in America, accounting for more than 25 percent of the entire comics market. IN THOSE BRIEF YEARS BEFORE THE IMPOSITION OF the crippling Comics Code Authority, which prescribed vanilla characters, action and outcomes, romance comics were relatively gritty  erotically charged, violent and somewhat ambivalent about human nature (and social convention). Nevertheless, the post-code era didn't signal the complete homogenization of romance comics. In addition to the wide range of hybrid concepts  Western romance, war romance, supernatural romance, medical romance, etc.  the stories actually provided a constantly changing reflection of the times, albeit weirdly distorted. Social fashions like juvenile delinquency, beatniks, hippies and women's liberation were absorbed and transformed. And in spite of their obligation to wrap things up in a reassuring hetero-patriarchal Judeo-Christian bundle by the last panel, writers and artists found ways of raising and addressing a broad spectrum of genuine social issues along the way. The last few years were perhaps the oddest, with attempts to spice up the comics and recapture the with-it generation. Topics like free love, interracial couples, lesbianism and abortion were actually broached. But it was to no avail. After more than 200 consecutive issues, Young Romance, which had once given Superman a run for its money, ceased publication in November 1975, and the genre was almost completely forgotten. Superficially at least. Several generations of women were deeply imprinted by the form and content of romance comics, and that's something that isn't easily thrown off (I'm surprised there hasn't been a self-help book devoted to deprogramming their pernicious influence on women's expectations). There's also the winners-write-the-history-books syndrome. "Ninety-nine percent of the books on comics have been written by men, and they simply don't care about a field that was mostly of interest to women," points out underground-comic pioneer Trina Robbins, who has worked to correct this imbalance, and even tried to revive romance comics in 1987 with the short-lived Renegade Romance. "Many men have a very negative take on girl stuff, judging it by their superhero-comic standards, and therefore finding fault with the art, which is of course notorious for its lack of fight scenes." As women have gained prominence as auteurs in the world of comics, the legacy of romance comics  from direct parody to subtle structural influence  has played a pivotal role. Even confessional comics by male artists  Joe Matt's grueling Peep Show springs to mind  owe a clear, if unacknowledged, debt to the romance genre. Other evidence pops up as well: Tony Hendra's reconstitution of Roy Lichtenstein's romance-comic panel paintings into a narrative in Brad '61, and Jeanne Martinet's 2001 replacement of the text from classic romance stories with more jaded contemporary lingo in Truer Than True Romance: Classic Love Comics Retold! Trina Robbins devoted a quarter of her excellent historical survey From Girls to Grrrlz: A History of Comics From Teens to Zines to the rise and fall of the genre. But for the true love you have to dig a little deeper. While there have been several collections over the years  a very nice full-color paperback titled Heart Throbs: The Best of DC Romance Comics, Eclipse Books' recent Real Love, a fine 1988 collection of Simon and Kirby's early work, and a reissue facsimile of DC's Young Romance #1  they seem to go through just one printing. The only current collection I could find was a two-volume set of EC's brief stab at romance, part of Gemstone Publishing's project to reprint the entire EC catalog. EC is best remembered for being the scapegoat of Dr. (Seduction of the Innocent) Wertham's feverish, self-aggrandizing attack on the lurid gore of titles like Tales From the Crypt and the subsequent Senate hearings that resulted in the Comics Code, as well as the disappearance of all EC comics except for its satirical humor magazine, Mad. Its entire romance output  Modern Love #1­8, plus a few issues of A Moon, a Girl . . . Romance and Saddle Romances  offers abundant pleasures. Unfortunately, it doesn't include the one-shot story Lucky Fights It Through, which was Mad mastermind Harvey Kurtzman's first work for EC  a cowboy romance story warning of the ravages of syphilis! Otherwise, to get the genuine article you still have to go to the discard bins. Which these days means eBay. Original love comics often go for as little as 50 cents a pop, though art by Frazetta or pristine condition can make prices soar. The best deal is when you can get a stack of coverless comics. Although the covers are usually the most powerful single visual component, the total lack of collector value they leave behind means you can get quantities of classic stories for pennies. While you're online, there's also a tremendous archive of whole comics at www.jennymiller.com/romancecomics, scanned and stored by one Jenny Miller as part of her "Humanities Computing" course at the University of Maryland. As you can see, appreciation for this once-proud tradition is a piecemeal affair patched together by amateur enthusiasts who've been passing the torch for a quarter-century since romance comics died. But as long as the flame of belief burns brightly in our hearts, born of pain and joy, it is certain that our passion will find its true place in the world and live happily ever after.